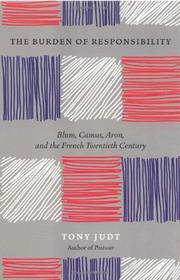 Approaching French intellectual history from a novel perspective, Judt (European Studies/New York Univ. ; Past Imperfect: French Intellectuals, 1944—1956, not reviewed) focuses on three leading 20th-century figures who had the courage to disagree with political sensibilities that prevailed among their contemporaries. Leon Blum, the leader of the French Socialist party and prime minister in the interim government of December 1946, is remembered mainly for introducing a 40-hour work week, wage increases, and paid vacation. His actual contribution to French political thought, however, went far beyond mere social reform. Blum was one of the first to warn French communists against the dangers of Bolshevik-style dictatorial terror. A literary critic, jurist, and politician, Blum was “a mirror held up to his country,” reflecting many of its strengths and weaknesses. Judt’s second subject, Albert Camus, shared Blum’s anti-Stalinist conviction and took every opportunity to debunk revolutionary myths. In contrast to radical intellectuals of the postwar period, Camus opted to defend absolute values in an age of relativism and emphasized the ethical dimension of contemporary dilemmas. A native of Algeria, Camus opposed the independence of his homeland, advancing instead an idea of an integrated Arab-European community. Finally, Raymond Aron, an existential philosopher, journalist, and member of the academic elite, echoed Blum and Camus in his polemic against the French intelligentsia’s Marxist leaning and in his firm opposition to Soviet totalitarianism. While Aron did not recognize any moral debt owed by the French to Arabs, he promoted Algerian independence for the sake of order and stability in France itself. A realist above all, Aron angered many Europeans by suggesting that a stable, democratic Germany reconstituted on equal footing within the European community was the best guarantee of security on the continent. This story of three solitary thinkers provides remarkable insight into the tensions that underlie political, philosophical, and ideological currents in contemporary France.